During the summer months (especially August), the juvenile bats can be observed flying around the roost. This is our busiest time of year and we must actively manage our schedule to accommodate everyone. Priority is given to those with bats inside their home. The summer is an excellent time to have bats removed from your home, since there is ample food sources and the young are able to fly. Large colonies consisting of juvenile bats and adults alike, take to the skies in August. You won't see them flying in tight formations, like America’s finest air force pilots. However, they do utilize a similar form of radar called echolocation to dominate the night. They strike beetles, moths, and other flying insects with ease. This explains their erratic flight patterns. If you see a flight path over your home, then you know that there is a colony nearby. “Bat detectors” can be used to pick up their radar frequency and help identify their location. These detectors can come in handy if one of the young cadets is flying a mission around your bedroom. During this time, any intrusions inside your living quarters is accidental, and they were likely looking for the attic roost. Sometimes, the enter living quarters through cold air returns. 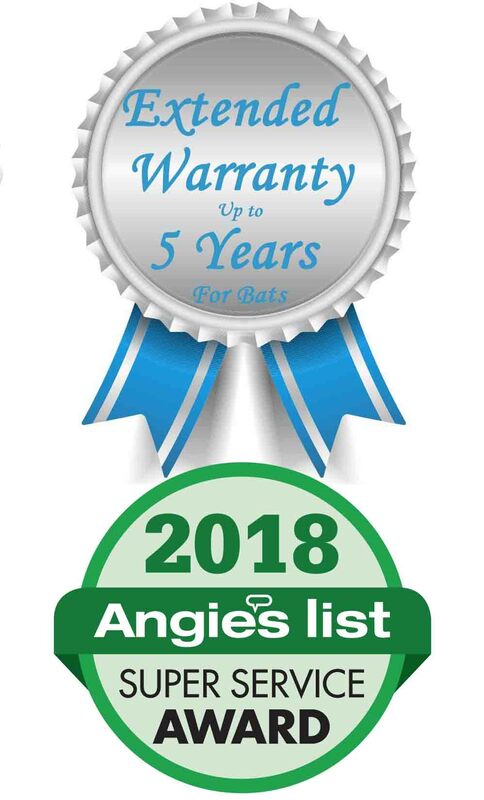 If you are getting bats in your home, and you do not regularly leave windows open at night, there is likely a summer roost in your walls or attic and you need to have a bat exclusion completed. Give us a call to begin the exclusion process quickly, otherwise the bats may over-winter inside the attic. Once they stop actively flying, they will remain inside the home until Spring.